There is an airport near the town. There is an express boat service from Bodø everyday except Sunday. The journey takes about 3½ hours. There is also scheduled bus to/from Narvik (stops at Evenes Airport; no ferry on the new road). In addition, the coastal steamer Hurtigruten arrives at 7PM (southboud) and 9PM (northbound) daily. There is a bus that will take you! Svolvær is really compact so the best thing you can do is walk. There are many art galleries here. There's a couple of hiking trails leading up to the mountains around the town. Though less known for hiking than other areas of Lofoten, some mountain tops offer magnificent views over Lofoten as well as the Norwegian mainland. Ask at the tourist information for advice and trail maps. It's not so easy to keep to the budget here. Narvesen kiosk is a good place to buy things such as drink. There's a bookshop in the town, art is being sold in many places and overpriced souvenirs are easy to find. There's lots of different kinds of accommodation. Hotels are widespread, there's camping or you can get a rorbu (a traditional fisherman's cabin). Sleeping outside is possible as it is quiet, but the temperatures can be near freezing even in the summer and the cold wind from the sea doesn't help at all. Thon Hotel Svolvær, O. J. Kaalbøes gate 5 . 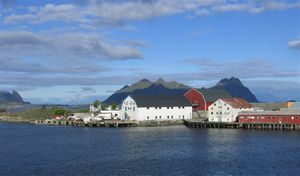 The hotel is centrally located in Svolvær, near the coastal steamer docks, in the heart of the spectacular area of Lofoten. Svinøya Rorbuer  - excellent rorbuer and restaurant on a separate island connected by a long bridge. Kabelvåg Youth Hostel  - There is no YHA hostel in Svolvær, but Kabelvåg, the next town west on the E10 has a great one. Beds or rooms, breakfast is included in the price. It takes about an hour walk from Svolvær city centre, or a 10 minutes bus ride. This page was last edited on 23 March 2018, at 15:20.